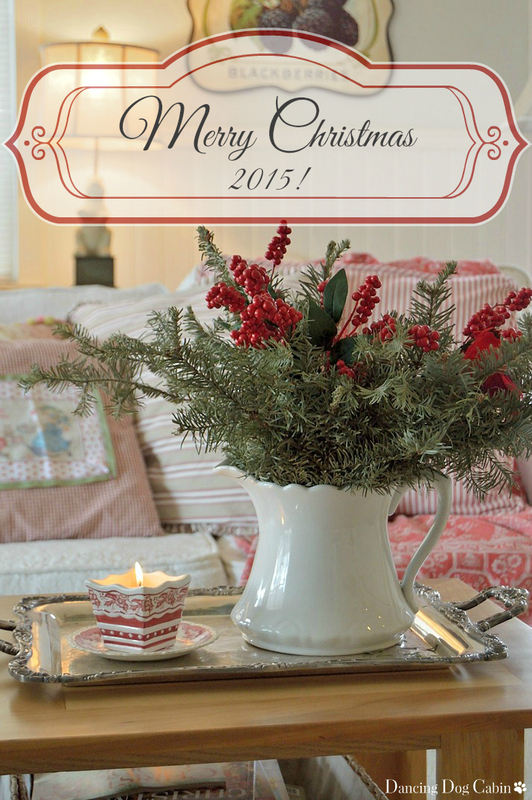 Dancing Dog Cabin: Merry Christmas 2015! I love to look at every one's interpretation of Christmas. All the textured neutral, silver and blue, silver and green, all white and modern, and countless other variations of different Christmas styles. All so pretty and elegant and festive. 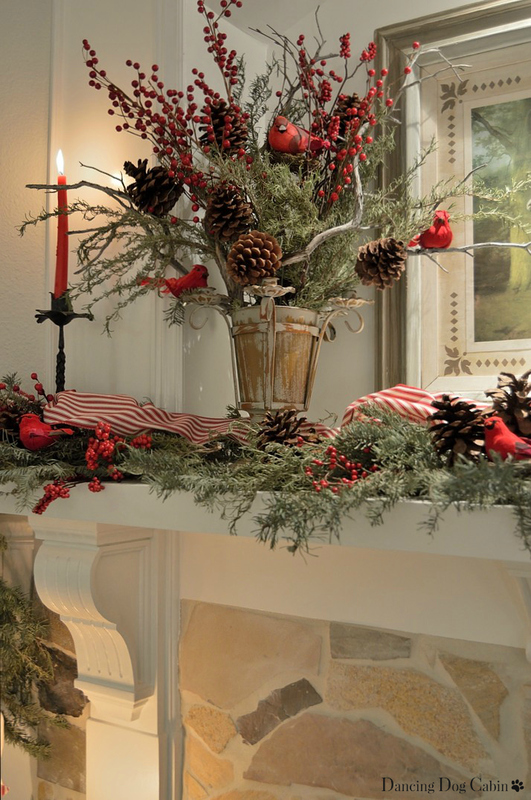 But, because I love red so much, I always end up decorating with traditional red and green. Red is so warm, so welcoming, so Christmas-y! 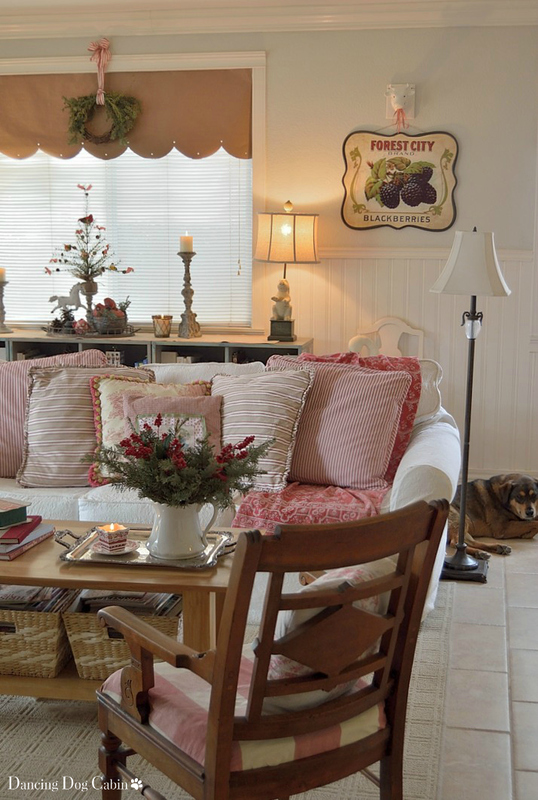 Here is all the jolly red that I have added to our family room. Wishing everyone a wonderful Christmas and happy, peaceful New Year filled with good fortune! 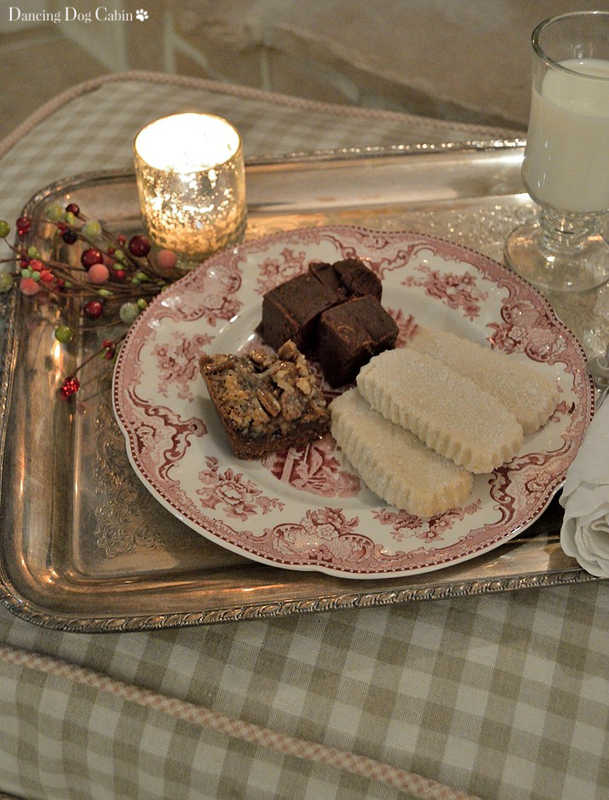 Santa's plate full of goodies. When I was little, finding a plate with half eaten cookies and crumbs up on the mantle Christmas morning was always proof-positive that he existed. Red is my favorite color, so it all looks wonderfully festive to me! Hope you had a wonderful Christmas! Thanks Amy! I hope you are having a wonderful Holiday season! What a beautiful Christmas setting. 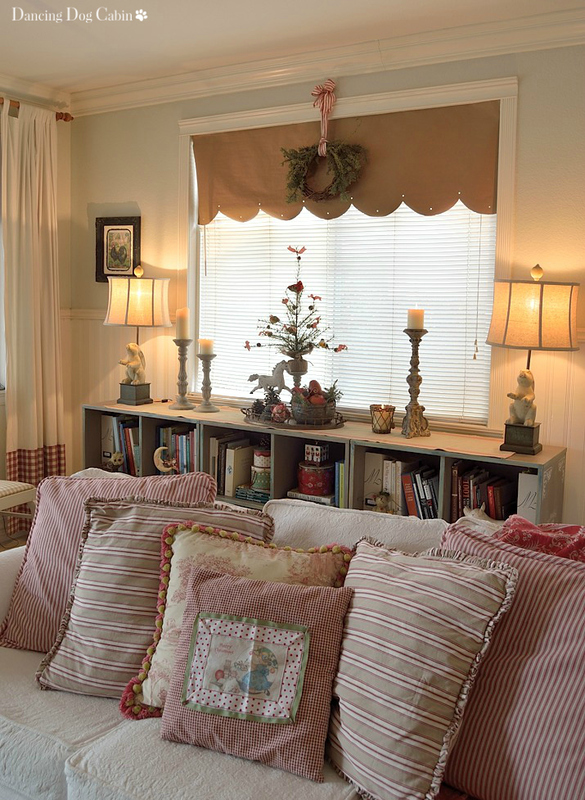 It has a bit of a vintage feel with the gorgeous striped ribbon and to match the striped red and white throw pillows. Love it. 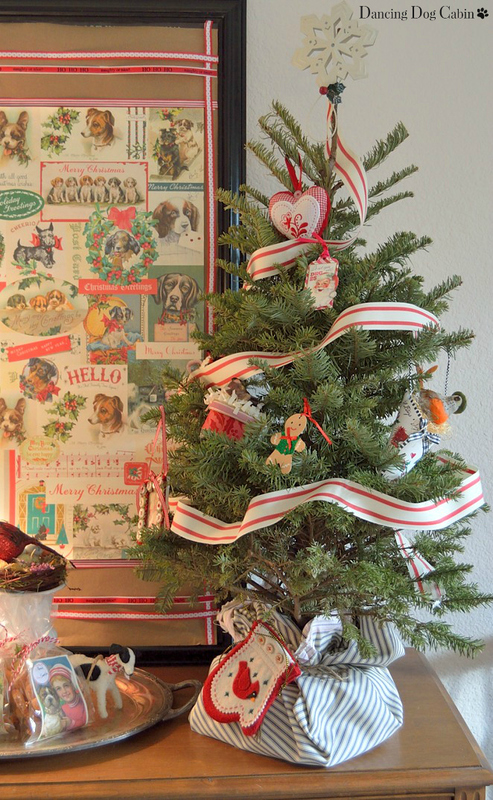 Oh I just *adore* your Christmas decor - you have it perfect. Love love love it. Very neat, I love your fireplace and your bookshelves. 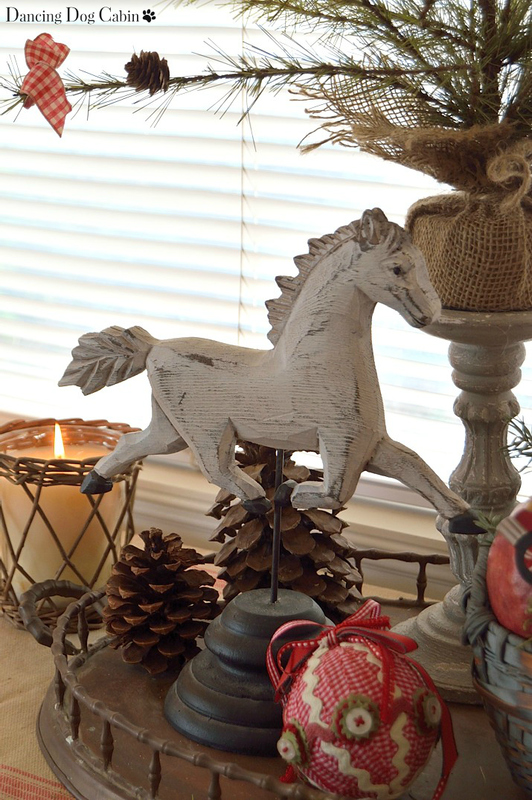 Christmas decorations really add to your beautiful room. This is one of the prettiest Christmas tours I've ever seen. Absolutely beautiful! Thanks Mimi! 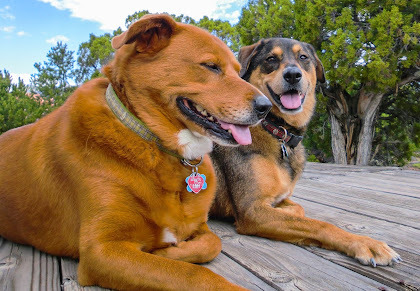 My dogs make me smile all the time so I guess the name is fitting. I hope you have a wonderful New Year! 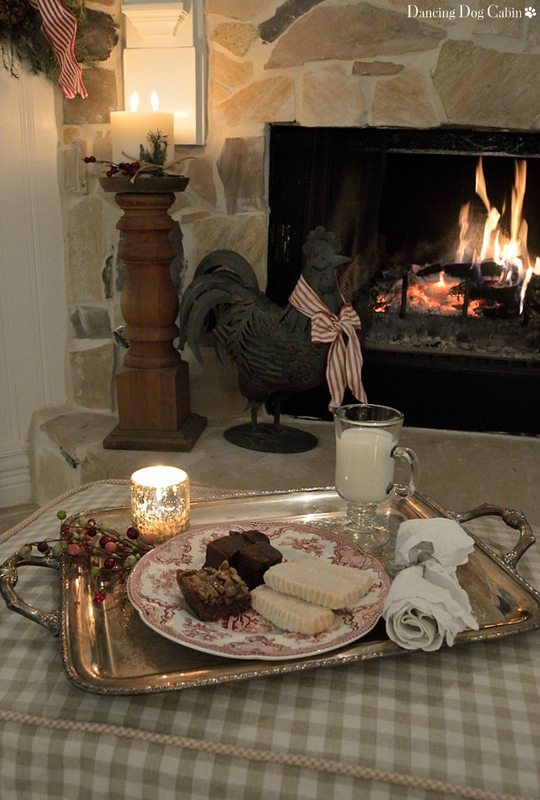 I adore your red and white stripe ribbon upon the mantle, dear one!!! 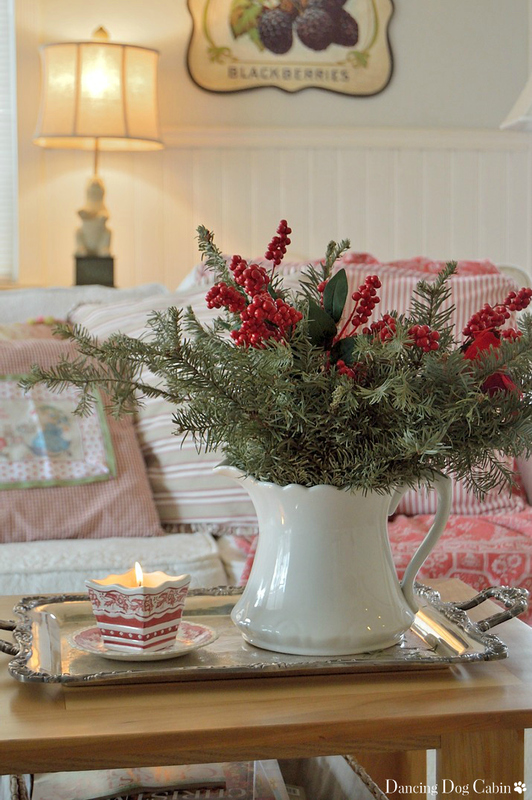 You have a lovely home filled with Traditional red, white and green Christmas Decor!!! So beautiful and warm. Lovely home. Oh how beautiful! I have just discovered your blog and it is THE prettiest I have seen in some time! So happy to meet you! Your decorating is just lovely! Plan to become a follower and linger on past posts! Happy New Year!!! Thank you and welcome! I'm so glad you found me and that you enjoy my blog. So charming and beautiful!!! 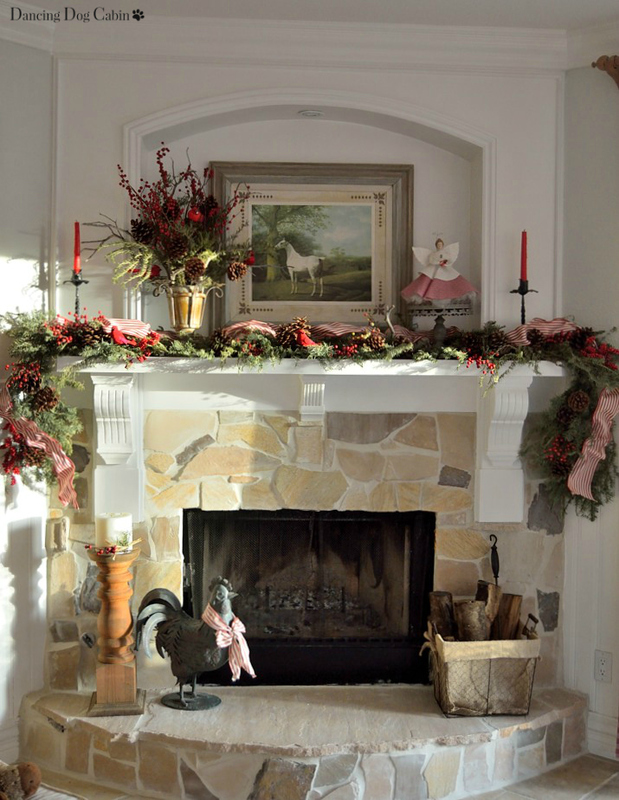 Your fireplace and mantel drcor are stunnng! Wishing you and your pups a Happy New Year! Thank you Carolyn! Happy New Year to you too! Christmas wouldn't be Christmas without red for this red lover! Love everything that you shared! You truly have the knack! Thanks for sharing with SYC. Thank you Jann! Yes, Christmas is all about red for me! Hi Melissa, just hopping back to let you know that I will be featuring you at SYC today. hopped over from Mrs Olson's SYC party to say your beautiful room is perfect. Especially love that window covering. Thanks! Guess what? It's made of construction paper, I'm waiting for window shutters to arrive and I just had to put something up temporarily. 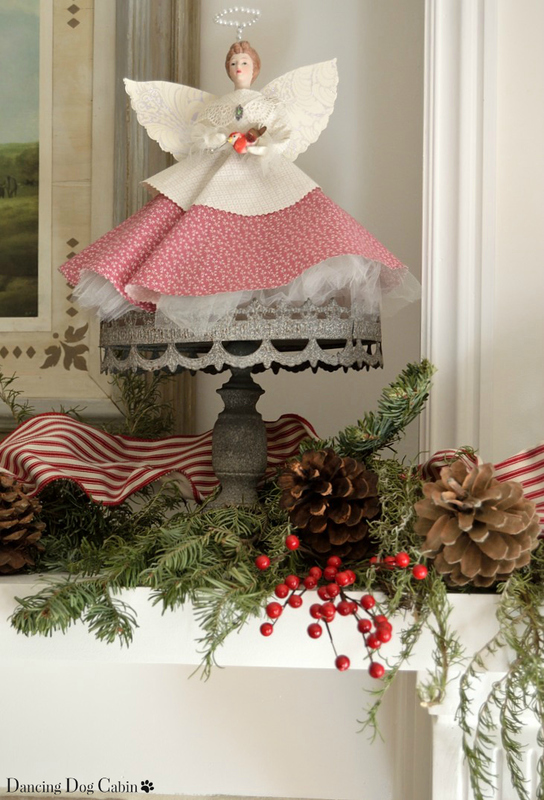 I love your little angel on the mantel! Thanks for sharing at Home Sweet Home! Happy New Year! Everything is BEAUTIFUL!!! Loved the tour. Melissa, looks like your home was decorated wonderfully for Christmas. I especially like your couch and throw cushions, it looks so comfy and homey. All the best for your new year. A charming place to gather. Makes me want to linger. Melissa, I love your Christmas decorations. I love the blend of textures and colors! 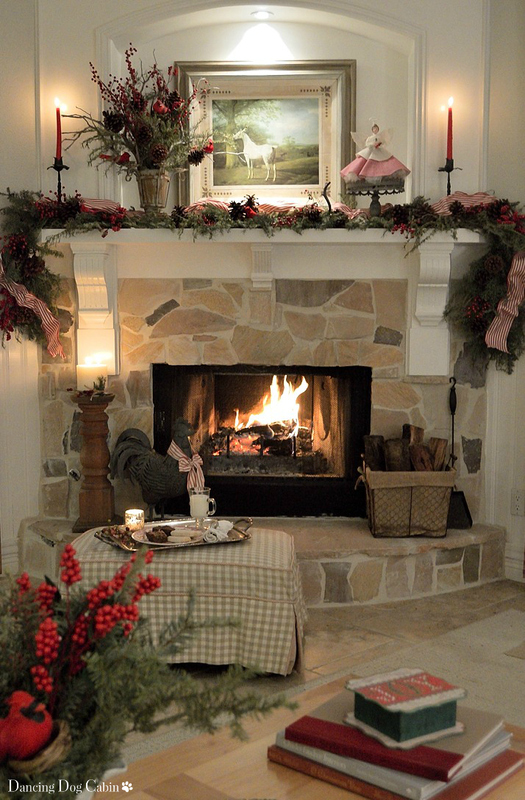 Your fireplace is absolutely amazing! I know redoing it was an undertaking, but it is just beautiful! Thank you Benita! Yes, it was a challenging project.